We’re thrilled to be bringing RoboSlam to Dublin Maker 2016 (Merrion Square, Dublin, Saturday 23rd July 2016). We’ve had a stand at Dublin Maker for the last two years and it’s an amazing event. 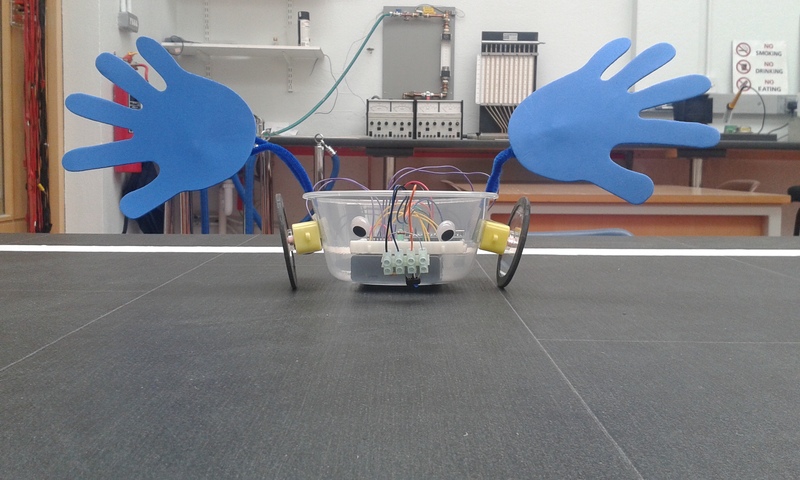 This year, like last year, we’ll be asking members of the public to try their hand at building a real programmable robot using the ultra low-cost RoboSlam kit (currently approximately 15 euro per robot) and some simple instructions. We’re in high volume production mode in RoboSlam HQ! This time around, we’re putting the RoboSlam kits into plastic bowls that double up as the robot chassis. The bowl works really well as a chassis. It carries the battery pack and breadboard circuit and the motors are just taped onto the outside. This is the main circuit of the robot built on a breadboard. The “brain” of the robot is an Arduino Nano which is an ultra low-cost programmable microcontroller development board. A colour sensor module on the front of the robot allows it to detect the colour of the ground underneath it. The robot can therefore navigate using white lines marked on the dark surface it’s driving on. Each motor is attached to the outside of the bowl with double-sided tape. The wheel and spacer are laser cut from 3mm acrylic so that they fit the shaft of the motor perfectly. Each motor is attached to the outside of the bowl with double-sided tape. In this photo, you can also see the black duct tape I used to attach the “jazz hands” to my robot via a couple of blue furry pipe cleaners. The on/off switch is on the battery pack. We recently switched to an Arduino-based circuit and we’ve made some additional modifications to the mechanical design especially for Dublin Maker, including a lovely plastic bowl chassis (from EuroGeneral). I’ve been testing the new design to make sure everything works correctly and this short video shows the test robot navigating its way around the RoboSlam arena. At one point, I rested my phone in the robot while it was driving to see the arena from its perspective. Apologies for the sound – it turns out it’s noisier than I thought to hitch a ride with the RoboSlam robot!